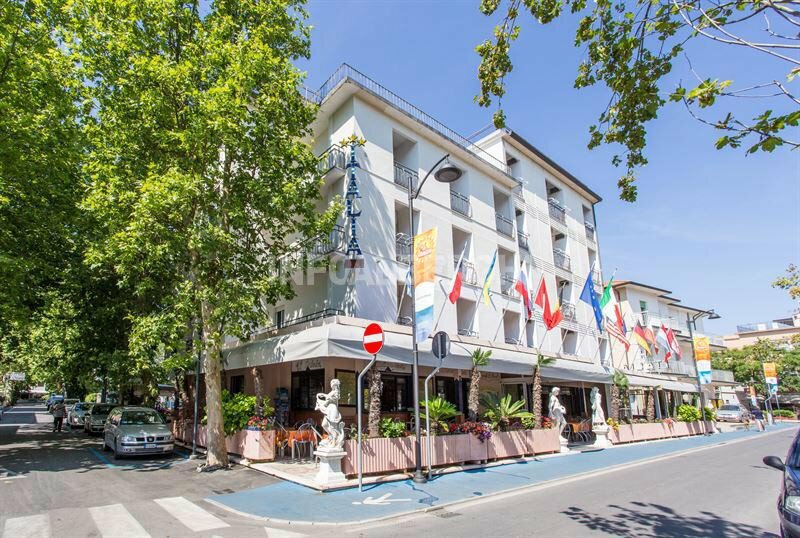 The 3-star Hotel Italia in Gatteo Mare, family run with an informal and welcoming atmosphere, is ideal for families and has parking, bicycles and free WI-FI. Admits small pets. The hotel is located in the center of Gatteo Mare in a quiet area, particularly suitable for family stays and those who want to relax. The beach is nearby and can be reached on foot in less than 2 minutes. Each room has a balcony, safe, telephone, satellite TV and digital terrestrial, WI-FI connection, air conditioning, bathroom with shower, hairdryer and complimentary toiletries. Rooms are cleaned daily. A cot can be added free of charge. Open-air porch, terrace, free bicycles, lift, free shuttle to the train station on request, theme nights with pizza tasting, piadina and desserts. PARKING: free for all guests. WI-FI: free connection throughout the entire hotel. AIR CONDITIONING: available throughout the building and at no additional cost. CONVENTIONS: beach, shuttle service on request. PETS: small animals are allowed. BREAKFAST: buffet with sweet and savory products including cheese, yogurt, cold cuts and coffee drinks. LUNCH AND DINNER: for lunch and dinner are offered traditional dishes of Romagna, with homemade pasta and desserts and a choice of 16 courses and fish always present. Drinks at meals are included. VARIATIONS: vegetarian and celiac dishes available. At meals: seats at the table, baby food and baby menù. At the affiliated beach Bagno Gianluca n. 28, guests find various services including entertainment and playground areas for the little ones. The prices of the price list are per person per day in an All Inclusive formula, for a stay. of 3 nights. Super offer for families in All Inclusive Formula. Family with 2 adults + 1 child up to 4 years FREE! Call us for a quote that fits your needs.